You are here: Home / HAPPY THOUGHTS / It’s a BIRTHDAY PRESENT Treasure Hunt! Growing up we always opened our birthday presents after our birthday dinner, which included the traditional cake and ice cream. I have done the same thing with my kids—but lately I have noticed that isn’t what everybody does (uumm…where have I been?). So out of curiosity– I have to know! It is “very” important (well, for a 6 yr. old) so please don’t leave me hanging…. 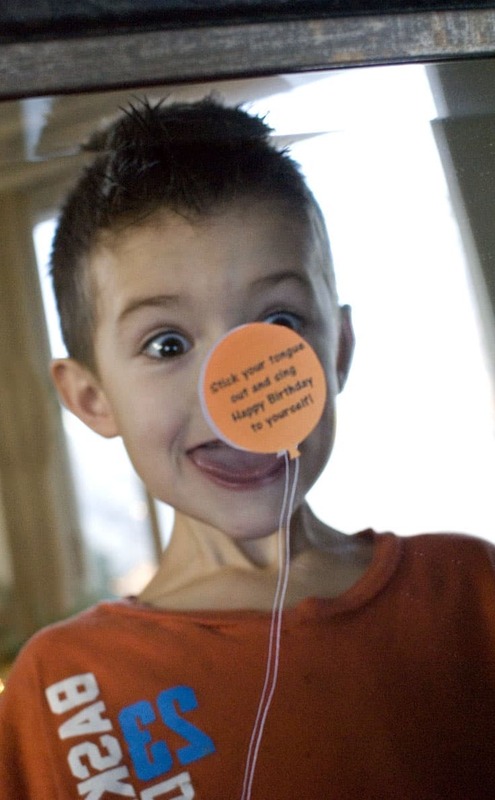 When your kids wake up on their birthday, do they get to open presents right away? or sometime during the day? or after dinner when it’s time for cake and ice cream? 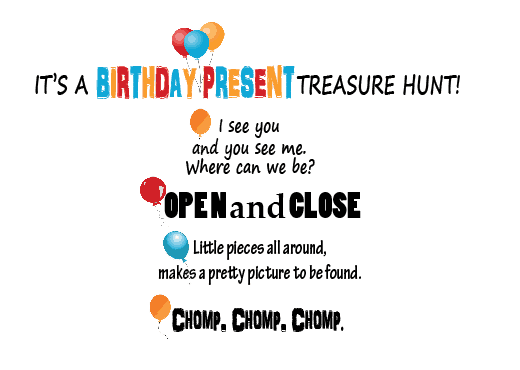 With my little man’s birthday this time around I thought it would be fun (you should know where I’m going with this…) to make a treasure hunt out of finding his presents! I must be a genius because it was a HIT! You will. not. regret .doing. this. for. your. birthday. kiddos! 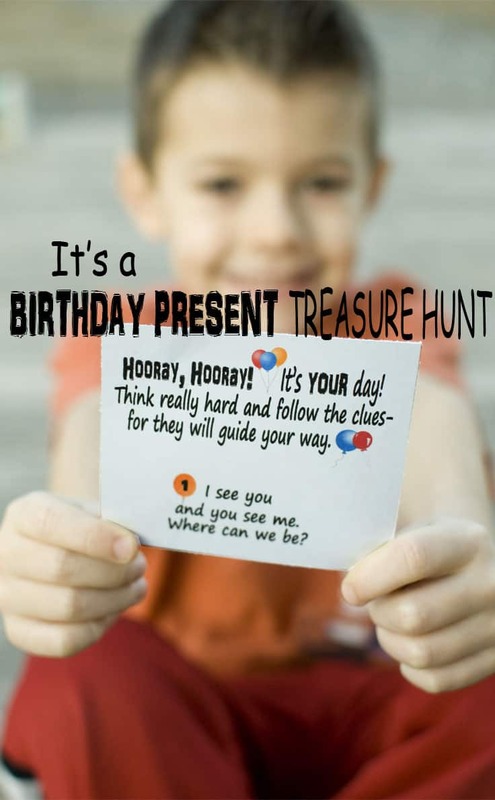 SAVE this Birthday Present Treasure Hunt NOW so you will have it when the time comes! I *may have* mentioned to him I was thinking of doing a treasure hunt for his birthday. His instantly requested that I add the little fun “things” to it, like the curse cards I had done for this post. So I added some balloons to the printable for you to cut out and add to whichever clue. You can put them with the clue or next to it- whatever your heart desires. Here he is being a goof, following the balloon instructions! Little did he realize that his clue was close by. You won’t find a treasure hunt much easier than this one! 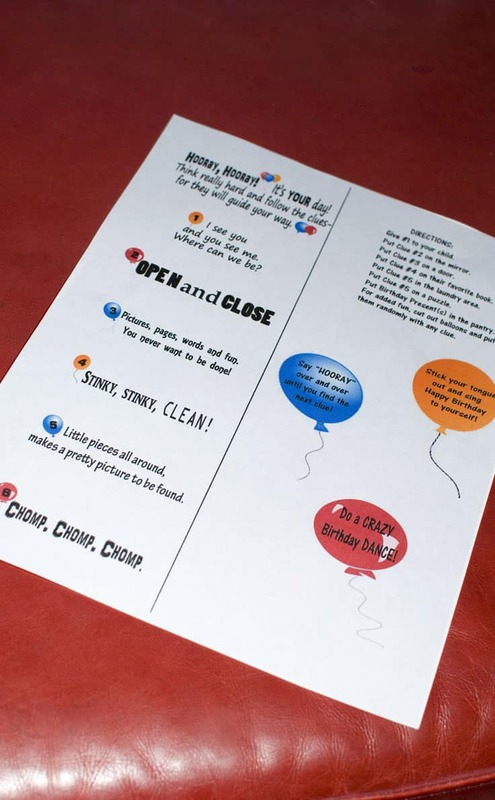 Just one page to print out and with a little bit of cutting and placing, you are good to go! My directions are on the printable to help make setting it up easier. 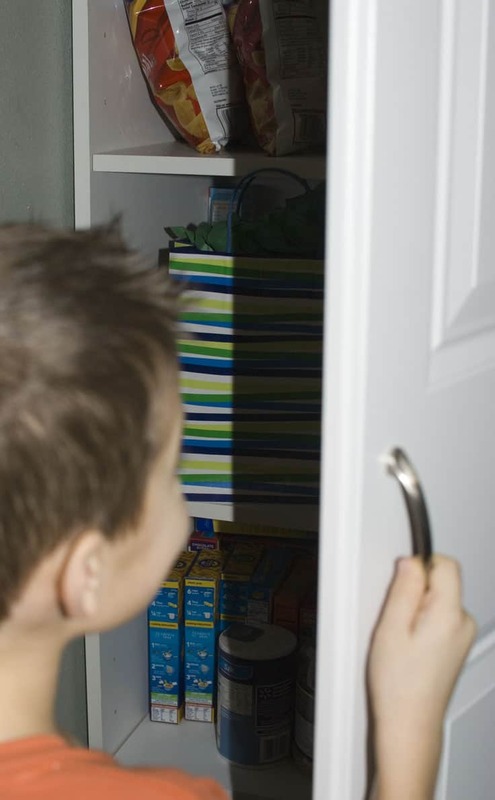 If you have multiple presents for your child you can hide them with any clue for your child to find during to the hunt. OR you can save them (however many you have) for the very end. I know–decisions, decisions! I decided to just wait until the end, where I hid his three presents in the pantry. With it all said and done, I think he would have liked to find presents throughout the hunt, too. Can i have birthday clues for my 13 year daughter leading to her favorite stores restaurant in mall? Hello, may I get some treasure hunt clues for a 13th birthday present to a Taylor swift concert for a girl.